Just a couple of things. I’ll be at Iskotew Lodge on October 11. 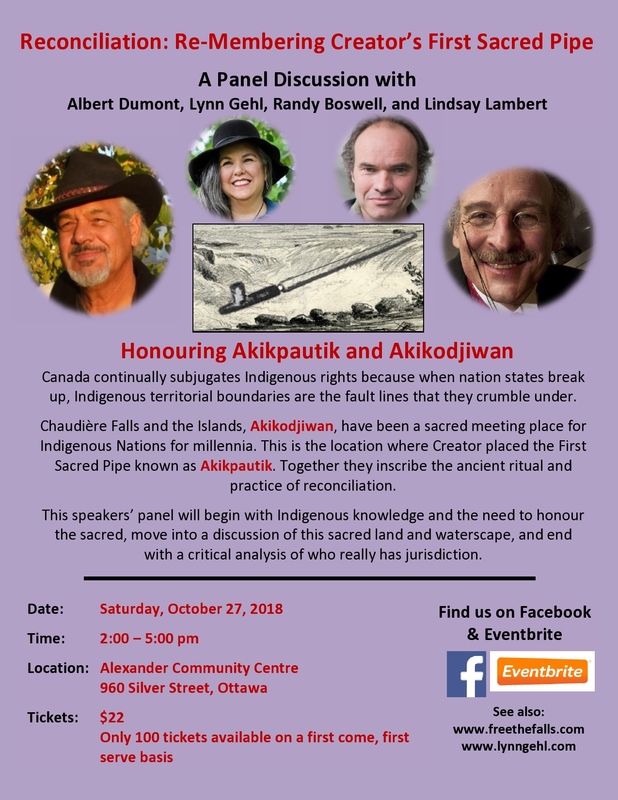 Also, I humbly request that you do your best to attend the panel discussion Reconciliation: Re-Membering Creator’s First Sacred Pipe on October 27th. See the poster and note that this event is a fundraiser for the Free The Falls group. I have a lot to be thankful for. Each and every dawn, for many years now, I offer a prayer of gratitude to Creator for all the blessings we find around us no matter where we turn: water, fire, the land, the wind, and all other sacredness which give us life. I am grateful for the love of my children and grandchildren. I hold in my heart a special place for human rights activists and for all my dearest friends and confidants. I am grateful to elders such as Gray Fawn (Jane Ann Chartrand) and Lame Buffalo (Bobby Woods). I am grateful that I do not live in a country where an outrageous individual like Donald Trump can become its president. Have you ever watched the movie “It’s a Wonderful Life”? Jimmy Stewart and his family and friends represent to me, who it is that Americans wish to become. Mr. Potter, the ruthless, vicious businessman is who Trump hopes the people of the United States will become. The choice: a ‘wonderful’ life or one which leaves you with no chance for spiritual reward after you leave this worldly life. Thanksgiving is my dearest feasting time! I live with chronic pain which seems to get worse and worse as the seasons roll along. I will never cry into a pillow because of it nor will I condemn Creator for the agony I endure. All I can say is that I am grateful to have a life. I am not in a wheelchair (not yet anyway). I will never let pain or anything else stop me from contributing to the emotional and spiritual wellness of my family, community, and nation. This entry was posted in Community, Nature, Spirituality. Bookmark the permalink. Creator God, May we all recognize and choose to follow your love, living within us now. Thankyou so much Albert for your words of gratitude for life as it is. I too am finding deepened gratitude for life, its challenges, its lessons, and its blessings. Over the last few days I have watched and listened to a free online conference provided by Sounds True. Waking Up in the World was an online event for spiritual activists. Many teachers from all over the planet were given the opportunity to provide free teaching sessions worldwide. Those who are aware that we are as a species generating much ignorance and arrogance and who attended this conference were greatly gifted. I am honoured to say that I was gifted with attending online, many of the lectures. But, there is even more good news. And we sure could use more good news right! The conference recordings, (over 30 hours of teachings) which include not only sound but video as well were made available for a reasonable price, and our dear friend Pamela Schreiner has purchased a copy so that we can all learn from these ‘boots on the ground’ teachers, to be more effective social activists. Earth Guardians youth director Xiuhtezcatl Martinez is an 18-year-old indigenous climate activist, hip-hop artist, and powerful voice on the fronlines of a global, youth-led environmental movement. At the young age of six, he began speaking around the world, from the Rio+20 United Nations Summit to addressing the General Assembly at the United Nations in New York City. Locally, Xiuhtezcatl has worked to get pesticides out of parks, coal ash contained, and moratoriums placed on fracking. His work has been featured by National Geographic, Rolling Stone, the Guardian,and CNN, among others, and he is the recipient of numerous awards, including the 2013 United States Volunteer Service Award from President Obama. So Albert, I share this news with you, knowing the unstoppable love in your heart you have for your family and your traditional spiritual path, and pray that our Creator continue to strengthen us all with courage, kindness, truth and joy. Migwech for sharing. Up and coming leaders will show us the way. I love the analogy with It’s a Wonderful Life – I watch it every Christmas and love it each time. I also have chronic pain and am still thankful. I am still trying to find an answer though and if I do, I’ll share it. No matter how hard we have it, we always have to be thankful ’cause it could always be worse.